The whole of human civilization spends less than one thousandth (<0.1%) of the world's annual GDP on space exploration and development. In comparison, the world spends about 10% of its GDP on health care, and more than half a percent (>0.5%) on... Advertising. We already possess all of the technologies we need in order to establish human outposts on the Moon and Mars—the only thing we're lacking is the capital investment needed to see these projects through. Space will become drastically less expensive once we figure out reusable rockets. Image: NASA Goddard/Bill Ingalls. SpaceX has already landed eight of its rocket boosters back on Earth (or, more frequently, on an ocean barge) after having delivered payloads to orbit. While these eight boosters have yet to see their second flight (though one of them did explode while preparing for a future launch, so only seven remain intact), part of Elon Musk's long-term goal for SpaceX is achieving full reusability of its rockets. Specifically, the rocket company wants to launch a payload into orbit, land the rocket back on Earth, refuel, and do it all over again. To the casual observer, it may even look like rockets are beginning to replace super-cars as the preferred play-thing for Silicon Valley billionaires. In addition to Musk's high-profile SpaceX, Amazon founder Jeff Bezos has his own rocket company—Blue Origin—that's looking to do the exact same thing. While Bezos' Blue Origin has launched, landed, and re-flown a small rocket booster multiple times, the company has yet to deliver a payload into orbit (they don't have a rocket big enough to do so). These two rocket startups are fast becoming competitors in a new kind of space race: both of them are looking to decrease the cost of spaceflight exponentially by developing fully reusable rocket boosters. As things currently stand, SpaceX already delivers hardware into space cheaper than most, charging around $60 million per launch of its 20-story rocket. This works out to about $5,500 per kilogram delivered into orbit. For comparison purposes, other for-profit launch providers typically charge between $10,000 and $25,000 per kilogram. Despite already having a highly competitive price-point, SpaceX is hoping to reduce this cost to around $250 per kilogram—a 95% cost reduction. This would entail launching a Falcon 9 rocket for around $2.5 million. To do that is going to require full reusability. In order to achieve that price-point, each rocket would need to be launched about one hundred times in order to recoup the initial costs of manufacturing the rocket. The obvious analog to the problem of rocket reusability is that of airplane reusability. The reason commercial air travel is so affordable is because modern airliners can make tens of thousands of trips over the course of their lifespans. If every time you flew on an intercontinental flight they had to scrap the plane and build a new one from scratch, airline tickets would cost millions of dollars, and almost nobody would be able to afford air travel. The reason the present-day space industry is prohibitively expensive is because we don't reuse the hardware. But if rockets can be made reusable, then the costs associated with spaceflight can be reduced dramatically. If SpaceX or Blue Origin (or both) succeeds in building a fully reusable rocket capable of making dozens (or hundreds) of consecutive flights, then the cost of launching hardware—namely satellites—into space will drop substantially. And as satellites and other hardware becomes more affordable to launch, the demand for space infrastructure will explode. Currently, it can cost hundreds of millions of dollars to design, manufacture, and launch a communications satellite. But if launch costs can be brought down, then the entire process could be streamlined—satellites capable of beaming high-speed internet down to ever corner of the globe could be mass-produced (because launching into orbit would be so affordable, it would become economical to establish assembly lines rather than custom-building every individual satellite). The key metric here is affordability; the costs of launching hardware into space is a huge barrier to the development of off-world outposts. The emergence of reusable rockets will have a drastic effect on our ability to explore and thrive in space. This is one of NASA's experimental ion engines during a test firing. Image: NASA. Getting a spacecraft into orbit is one thing. But getting a spacecraft from Earth-orbit to another planet is an entirely different, though slightly related, problem. Current in-space propulsion methods generally use the same sort of propulsion system as rockets do: combustion engines that burn flammable fuel. All of that fuel has to be launched into space on the same rocket as the spacecraft itself. Unfortunately, burning flammable liquids in space isn't the best idea. Firstly, it takes a lot of fuel in order to produce the thrust needed to traverse deep-space distances. Secondly, that fuel is inefficient, heavy, and prone to catastrophic failure (read: explosions). 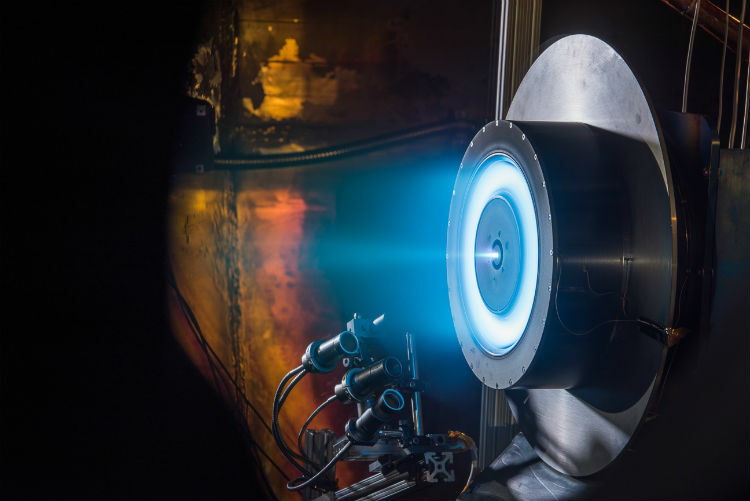 Fortunately, a new type of propulsion system has been emerging recently that could change the landscape of in-space propulsion: the ion engine. It's not nearly as Science-Fictiony as it sounds, and this engine design has already been used on several spacecraft (most notably, NASA's Dawn spacecraft in orbit around Ceres). These next-generation engines use electric currents to accelerate gas particles (usually xenon) and shoot them out the back of the spacecraft, thus creating a very small amount of thrust. Although the thrust is minuscule (about the weight of a piece of paper in your hand), it accumulates over extended time periods. By far the best thing about ion engines is that they're incredibly efficient. Whereas combustion engines use chemical reactions to shoot particles out of the engine at a few kilometers per second, ion engines manipulate the properties of physics to shoot particles out of the engine at 20-50 kilometers per second. The result is that one ounce of fuel in an ion engine (xenon gas) is capable of producing ten times more thrust as one ounce of fuel in a combustion engine (such as liquid oxygen or kerosene). The primary difference is that, while combustion engines are more of a sprint, ion engines are more of a marathon. A rocket could accelerate a spacecraft out of Earth's gravity well in a matter of seconds. But it could take days for an ion engine to generate enough thrust to leave Earth orbit (ion engines are able to fire continuously for years, assuming they have enough fuel). ut this lengthy acceleration doesn't really matter for space travel. Since most deep-space destinations are months or years away anyways, taking a few days to get up to cruising speed doesn't slow things down at all—and the benefit is that there will be plenty of fuel leftover for future maneuvering. Future exploration missions will utilize increasingly powerful ion engines to conduct more in-depth missions than ever before. By using significantly less fuel for ever maneuver, a spacecraft would be able to visit multiple destinations in sequence. For example, a probe could be sent to orbit Uranus (which has never been done before) and study its internal structure. Then, after a few years, it could fire up its ion engines and gradually build up enough momentum to reach Neptune, and do the same there (which has also never been done). Once satisfied with Neptune, the same probe could even make a maneuver to enter orbit around Neptune's largest moon, Triton—and still have fuel to spare. The electric-engine revolution isn't just happening in the automotive industry—it's happening in the space industry, too. 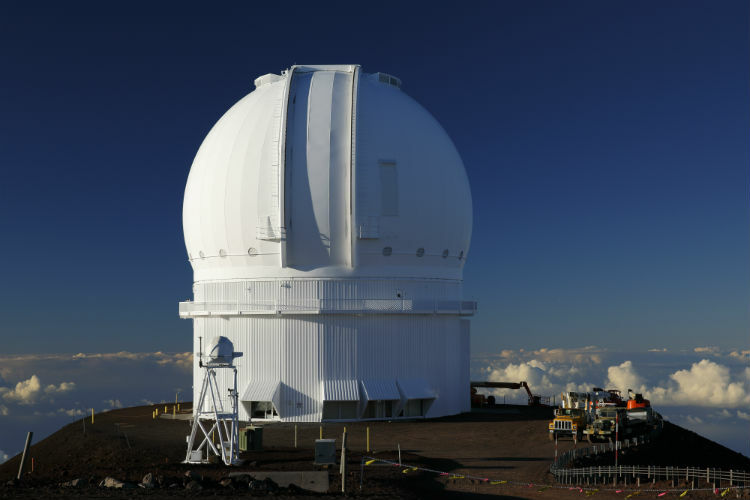 An image of the Canada-France-Hawaii telescope at an altitude of 4,204 meters on Mauna Kea. Image: Ed Dunens. Last week, NASA announced the discovery of seven Earth-sized exoplanets around a star about 40 light years away from Earth. Three of those planets may support liquid water on their surfaces. They may even be habitable. With more powerful telescopes, we would be able to definitively determine whether or not they are habitable. We would be able to measure the chemical composition, density, and temperature of their atmospheres, and that would tell us whether life (as we know it) could survive there. For now, these exoplanets are too small and too close to their host star to be directly imaged, even by Hubble. But the next generation of massive telescopes will be able to resolve some distant exoplanets. Multiple extremely large telescopes are currently being constructed, ranging in size from 24 to 39 meters in diameter and planned to be completed sometime in the 2020's—and they'll be capable of taking images that are 10 times sharper than those of the Hubble space telescope. Also, in 2018, there's going to be a new addition to the space telescope lineage: the James Webb Space Telescope, an infrared observatory that will be able to peer all the way back to the earliest days of the universe—as well as aid in the hunt for biosignatures in the atmospheres of nearby exoplanets. Beyond these cosmological pursuits, there's also the elephant in the room that we need to address: the looming threat of asteroid impacts. Several arrays are currently in operation (or in varying stages of construction) that are designed to detect near-Earth asteroids that may pose a threat to human civilization. In 2005, the United States Congress signed it into law that NASA was to find 90% of all near-Earth asteroids 140-meters or larger by 2020. To date in 2017, they've found over 90% of all 1-kilometer and larger asteroids, but only around 50% of the asteroids greater than 140-meters in diameter. These 140-meter asteroids are known as region killers because, if one of them were to impact Earth, it would destroy an entire geographic region—potentially causing millions of deaths (dependent upon where it struck). The unfortunate thing about asteroids is that, as they go up linearly in diameter, they go up exponentially in explosive yield. For example, the Chelyabinsk meteor that exploded over a sparsely populated region of Russia in 2013 was only 20-meters in diameter, and it caused about 1,500 injuries. Another incident happened in 1908 in Siberia, when it's alleged that an asteroid with a diameter of at least 60-meters exploded over a densely forested area, knocking down some 80 million trees. Such a blast would have level major city. Finding more of these potentially deadly asteroids before they collide with Earth is (or should be) a massive priority. With improved telescopes offering greater coverage of our near-Earth environment than ever before, hopefully we'll be able to alter the course of the Russian roulette game that we're currently playing with the cosmos. That is, if we can find all of those space rocks in time. 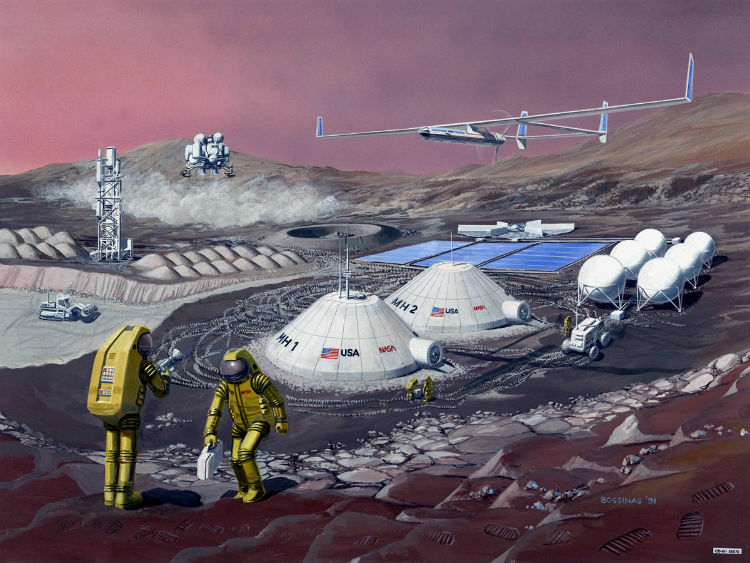 This is what a future Mars base might look like, only with more robots and less tacky yellow spacesuits... Image: NASA. The applications of 3D-printing technology are going to be nearly endless. But one area in which they'll have a particularly poignant impact is going to be space exploration. It's only a matter of time until a 3D printer is designed that's capable of fully assembling a car, piece by piece, from raw materials. After that, they'll be able to make airplanes. And after that, they'll be able to manufacture whole spacecraft—either in orbit or on the Moon or Mars. Before that, a 3D printer will be capable of manufacturing spare parts involved in spaceflight. Long-distance human missions to the Moon or Mars will require in-house 3D print-shops capable of spitting out bits and pieces of hardware that couldn't be brought along—spare parts, tools, upgraded modules, and so on. Eventually, a 3D printer in space might even me incorporated into a full-fledged von Neumann Probe. While it may sound like something out of Science Fiction, this idea does make sense logistically. If we're going to build outposts on other worlds, we only have two options: a) ship all of the stuff that the outpost will ever need far in advance, or b) manufacture it on-site. Option a) requires an incredible amount of storage space and planning (a warehouse of every part they could ever need, a list of every part that could possibly fail). And since sending a space-parcel from Earth to Mars takes several months, a crewed outpost on the red planet better not run out of something important. Option b) simply requires one machine and the ability to gather materials on-site (or recycle old stuff). Everything else can be sent digitally in the form of blueprints, and from there the 3D printer can do its thing. Heck, a good enough 3D printer could even manufacture a spare 3D printer, just in case. On top of that, we can't expect astronauts to do all of the outpost-building on-site. That would be dangerous and require a lot of working hours (and those come at a premium in deep space). Instead, we'll probably want to send robots capable of putting together the shell of an outpost for us, using parts spat out of a 3D printer on-site. It's just a matter of time before remote 3D-printing becomes standard operating procedure. It's fun to imagine what the future might look like, even if there's a good chance we might end up being wrong. But I think that these four innovations are going to have a gigantic impact on the way we conduct ourselves in space in the coming decades.